Although uncommon for garage doors, under certain specific situations, it could happen that a sealed, double-pane (thermopane) window breaks with small fractures appearing in the corners. Note that this text will not cover all those situations where a window is accidentally hit by an object. A double-pane window can break due to an excessive variation in temperature over a short period of time. Breaks due to thermal shock are a result of stress generated by temperature variations between two areas within a pane of glass. For example, this variation can develop between a section of a window exposed to direct sunlight and a shaded section. Under the effects of the sun, a window heats up even more as its energy absorption is high. If a section of the window remains cold, it stops the hotter section from freely expanding, thus generating compressive and tensile stress respectively in the hot and cold parts of the double-pane window. As glass is less resistant in traction than in compression, the tensile stress generated is likely to exceed the tensile strength of the glass thereby causing breakage. This type of break is seen at the edge of the window, in the coldest part of the frame, and is characterized by a perpendicular (90°) fracture at the edge on both sides of the glass. Climate conditions: The difference in temperature within a double-pane unit depends directly on the intensity of the solar radiation that reaches it based on the orientation of the unit, the time of day, and the season, and the maximum difference in temperature between day and night. Double-pane units facing north pose little risk of thermal breakage, as they are not exposed to the sun. Characteristics of the double-pane unit: The higher the energy absorption factor of the glass, the higher the unit heats up under the effect of sunlight. For instance, glass on which a reflective film is affixed absorbs more heat than clear glass and is therefore more susceptible to thermal breakage. Thermal inertia of the frame: The higher the thermal inertia of the frame, the longer it takes the temperature of the frame to adapt to external conditions. The frame color can also have some effect on the phenomenon. External environment: The external environment (ex. : shadows from trees) or the house itself may submit the double-pane unit to partial and extended shade. Interior environment: The environment inside a commercial garage can significantly increase the difference in temperature between the hot and cold areas of the unit. How to prevent thermal breakage? Sealed, double-pane windows (thermopane) normally stand up to these stresses. However, for specific reasons, there may be breakage. In these cases, the quality of the window unit cannot be called into question. for commercial garage doors: avoiding heating systems (radiators, convectors, forced air) too close to the glass, ensuring that they are at least 8 inches (20 cm) from the window. Air should flow parallel to the glass section or preferably toward the inside of the room. 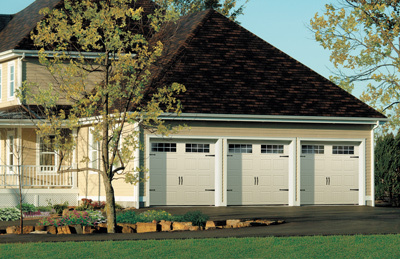 In all the cases presented above, it is important to know that they rarely happen to garage doors. For further information on the nature of Garaga product warranties, visit this link. Contact our garage door specialists to properly assess your situation and advise you on the best type of windows for your garage doors.